#0339 – SQL Server – I’ve moved! How to stay in touch with me? 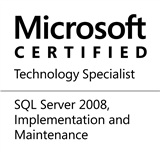 My blog has always been the documentation of my evolutionary journey through the world of databases, especially, Microsoft SQL Server. Today, on the birthday of our daughters, I am pleased to announce the start of my blog, SQLTwins at http://nakulvachhrajani.com. I dedicate my journey with Microsoft SQL Server to our daughters, Devika & Devina. The content on my pages in BeyondRelational.com [Link] will be moved (gradually) over to the new blog. Today’s post is a brief summary of the various ways in which you can stay in touch with me. I will start posting to my blog (http://nakulvachhrajani.com) effective today. You can leave a comment (every one of which will be read by me). I would like to hear from you, so please leave your feedback – whether you liked the post, did not like it (if not, why), and what else would you like to know. I eagerly look forward to your comments. You can follow my blog or even subscribe via E-mail! Do note that it’s generally a busy day at the office for me, so I don’t post updates on my stream often. That’s pretty much it. There aren’t too many channels, which helps me to read each reply, comment or query that you might send out to me. This entry was posted in Blog, Community on July 27, 2014 by nakulvachhrajani.